Perseus Hybrid Cucumber | Gurney's Seed & Nursery Co.
Quite simply the best cucumber for fresh eating. This 6-in. Beit Alpha type has thin tender skin, crisp juicy flesh and an unbelievably sweet, refreshing flavor. Full vines have an incredible array of disease resistance including mosiac virus, mildews and wilts, ensuring Perseus will be very successful in any garden. 50 DAYS. Fruit6 inch dark green fruits with thin skins and no bitterness. Soil RequirementsWell-drained average garden soil. 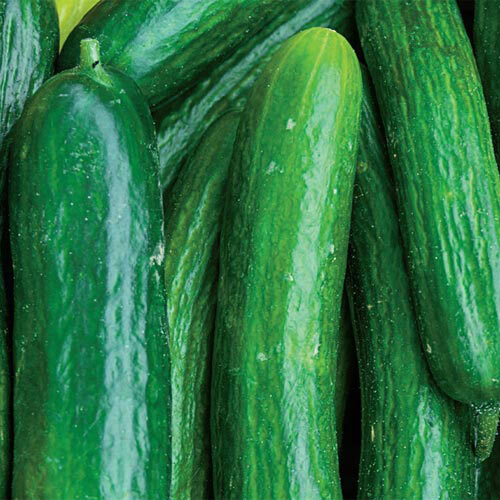 CommentsBeit Alpha type cucumbers are crunchy and delightfully juicy, with a wonderful sweet flavor that's excellent for fresh eating! The 6 inch dark green fruits have thin skin and no hint of bitterness. Perseus has incredibly high disease resistance and produces very heavy yields. 50 DAYS.